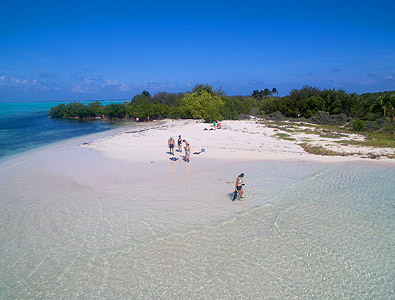 Little Cayman is the smallest and least populated of the three Cayman Islands (Grand Cayman, Cayman Brac, and Little Cayman). The island is 10 miles long and 1 mile wide, with fewer than 200 full-time residents. Though Little Cayman is a tropical paradise with limited human development, it is only a short, 30-minute plane ride from Grand Cayman, which is easily accessible with direct flights from Miami, Houston, Tampa, New York, Atlanta, Charlotte, Toronto and many other major cities. It is this combination that makes Little Cayman a mecca for marine researchers and educators alike. The close proximity to Grand Cayman, with full medical facilities and access to fresh food and resources means Little Cayman is extremely well supported, for a small tropical island. The coral reefs of Little Cayman are arguably the best in the Caribbean for research because they are isolated from continental and anthropogenic influences and support a biologically diverse marine ecosystem. The local reefs contain large populations of mega fauna, including spotted eagle rays, one of the last spawning aggregations sites with thousands of Nassau grouper, year-round hawksbill and green turtles, as well as loggerheads in mating season and a shark population — all protected by the Bloody Bay Marine Park. This combination of water quality, diverse coral and fish species, and abundance of easily seen large mammals and fish is also why Little Cayman has been rated one of the top diving destinations in the Caribbean. Little Cayman is not just a marine haven however. In terms of terrestrial species, Little Cayman has the largest breeding population of Red-Footed Boobies in the Western Hemisphere, a healthy population of frigate birds, the endangered West Indian whistling duck, occasional parrots, abundant endemic rock iguanas which grow over 4 feet long, anole lizards, and a wide variety of land and sea crabs.